Flipkart’s ‘The Big Freedom Sale’ will start on August 9 and go on till August 11. Flipkart will be offering discounts across a range of products, including smartphones, laptops, smartwatches, television sets and others. Now ahead of the sale, Flipkart has given a sneak peek at some of the deals it will have in the smartphone category. Here’s a quick look at the top offers. The e-commerce site will have 72 hours of sale for Xiaomi Redmi Note 4 smartphone, and will offer all three variants of the device. Redmi Note 4 with 4GB RAM and 64GB storage will come with a maximum of up to Rs 12,000 off on exchange. So if you have a working device to hand over, you can get further discount on the price. Redmi Note 4 priced Rs 10,999 will also be part of the exchange scheme with a maximum discount of Rs 10,000 under the scheme. This version has 3GB RAM and 32GB storage on board, but the rest of the specifications are the same. Redmi Note 4 variant at Rs 9,999 will get a maximum of Rs 9,000 off on exchange, and sports 2GB RAM coupled with 32GB storage. The maximum discount you’ll get under exchange will depend on the device you are trading in for the Redmi Note 4. The good news is the sale will last for 72 hours, so if you’ve been wanting to get this phone, now will be a good time. Apple iPhone 6 will get a special price on Flipkart as part of the sale and this is for the 32GB storage variant. Apple iPhone 6 is currently priced at Rs 29,500 on Flipkart and the phone will get a big discount during the sale, which the company has not yet revealed. Google Pixel XL will also be offered on discount during the sale. The price will be Rs 48,999 for the 32GB storage version down from the original price of Rs 67,900. Other smartphones listed in the discount section are devices from Lenovo and Motorola. Lenovo K6 Power will be offered at Rs 8,999, while Moto G5 Plus will be priced at Rs 14,999 down from the original Rs 16,999 price tag. Additionally Lenovo K5 Note will cost Rs 9,999 during the sale, compared to the original price of Rs 12,499. The Moto M will be available at Rs 12,999 in the sale. Given that the Lenovo K8 Note is coming soon it might be best to wait, since the K6 and K5 Note are on the older side where specifications are concerned. 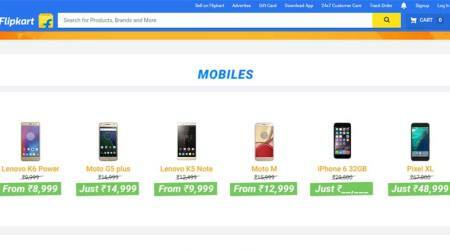 Be the first to comment on "Flipkart The Big Freedom Sale: Redmi Note 4, discount on iPhone 6 and more"